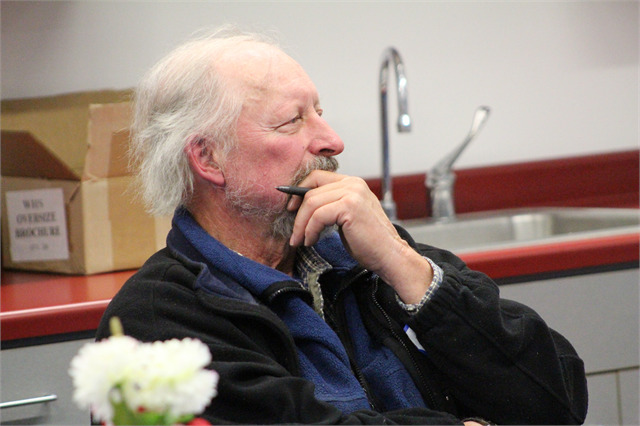 Ken Kurtz of Superior looks over boards filled with new museum suggestions from fellow attendees Oct. 1 at the Society's first statewide engagement session in Superior. "You blew us away with this wall," Society Director Christian Øverland told the crowd in his closing remarks. 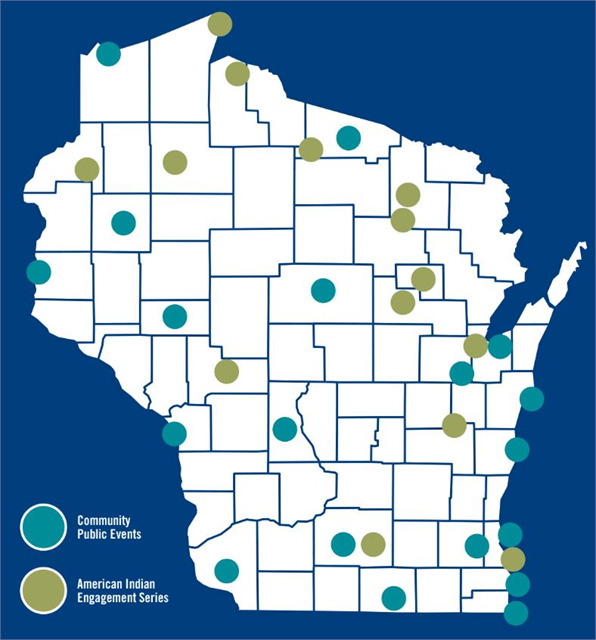 SUPERIOR — Residents of one of Wisconsin's northernmost cities were the first to share their thoughts about the Wisconsin Historical Society's plans for a new state history museum as their Oct. 1, 2018 session was the first of more than 30 planned across the state over an eight-month period. 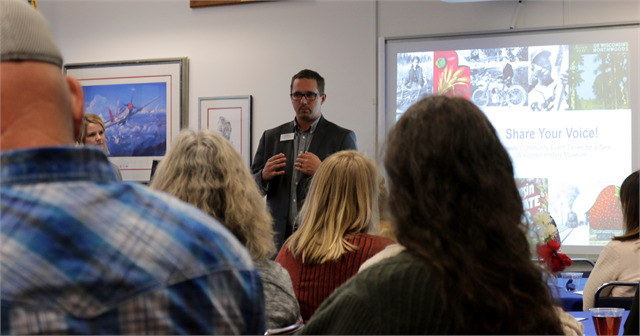 "This is about learning your stories," Society Director Christian Øverland told the audience filling a room at the Richard I. Bong Veterans Historical Center. "We want honest feedback." 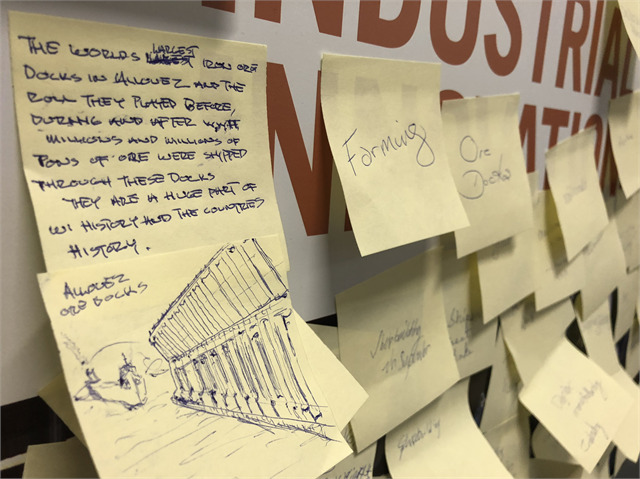 Participants reviewed early exhibit design concept renderings and provided feedback, engaged in discussions about their communities, and shared ideas about what they'd like to see in a new museum and what their favorite museum experiences have been. One guest recalled the "walking into a nondescript, unlabeled building and coming face-to-face with an open oven from (Nazi concentration camp) Dachau." Another mentioned the pleasure of "meeting museum docents who worked on the ships" featured in an exhibit. Superior Mayor Jim Paine was on hand and talked about the importance of history in his welcoming remarks. "When we talk to folks about what matters to them in Superior, it’s not the kind of things we talk about in politics," he said. "The things that make people connect to this place are the stories we tell about the people who have been here before and the place that they created." The session was led by Cybelle Jones, the Principal and Studio Director for Gallagher & Associates, the exhibit design firm chosen by the Society for the project. 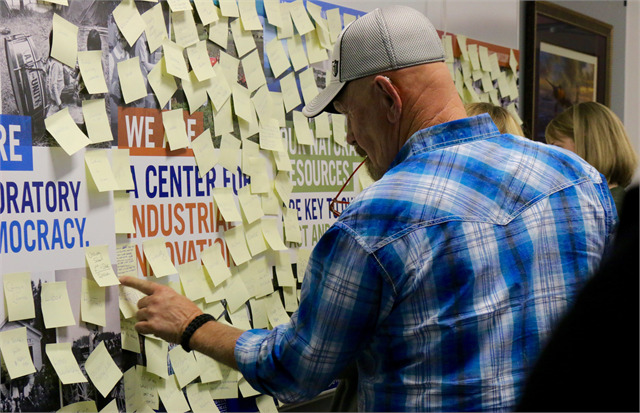 She invited guests to use Post-It notes to write down their ideas, and hundreds of ideas filled theme boards placed along a wall. "You blew us away with this wall," Øverland said in his closing remarks. "Cybelle and I have done events like this before in our careers and we’ve heard crickets." “You've set the bar really high," agreed Jones. 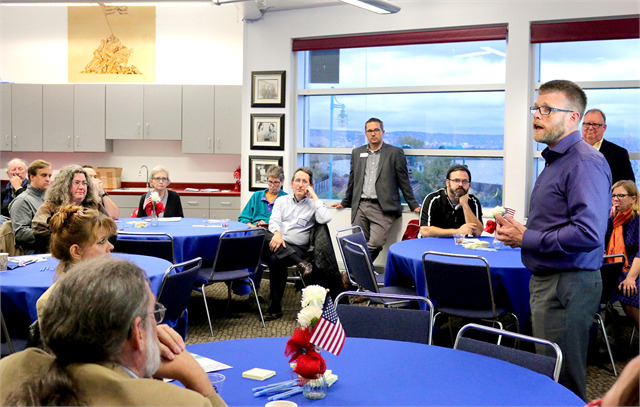 Superior Mayor Jim Paine welcomes guests to the Society's first statewide public engagement session Oct. 1. 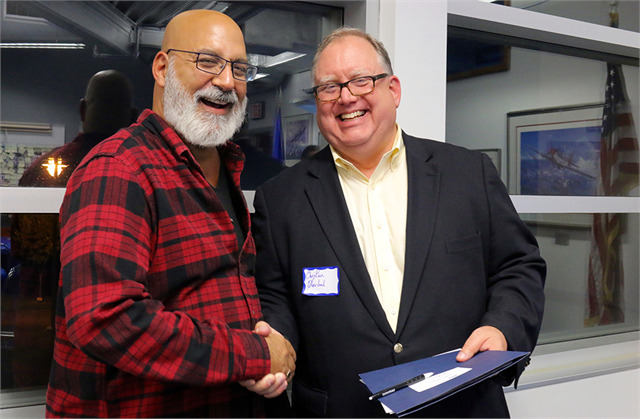 "I’m so proud that Superior gets to be the first city to participate in the conversation about a new museum that tells all of our stories," Paine said. 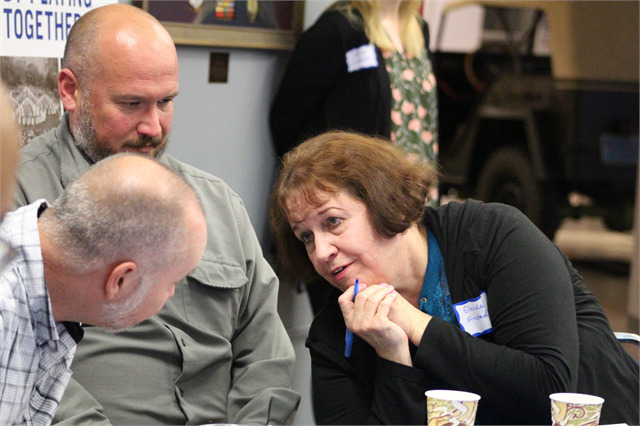 Gordon resident Glenda Finstad, right, discusses story ideas with Robert Quené, left, while her son Brian Finstad listens during the Superior public engagement session. Brian Finstad and Quené live in Superior. 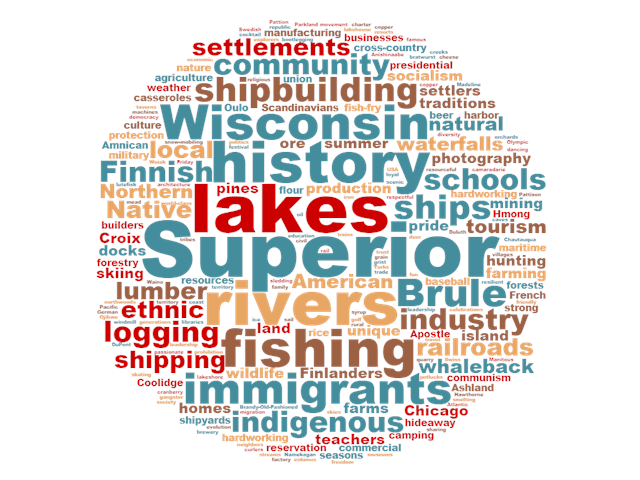 Superior's ore docks and its long history as one of the world's largest shipping ports were popular topics among the hundreds of notes posted by guests. Guests applaud at the end of the productive and engaging session. This word cloud was created from Post-It note suggestions by attendees at the Superior "Share Your Voice" session. 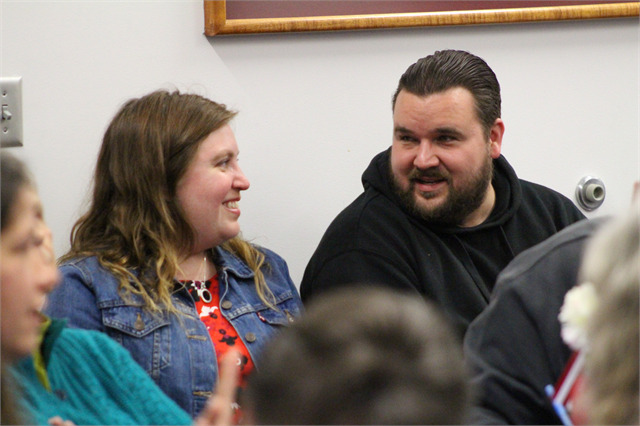 Society Director Christian Øverland, right, poses for a photo with a guest following the first "Share Your Voice" session in Superior. 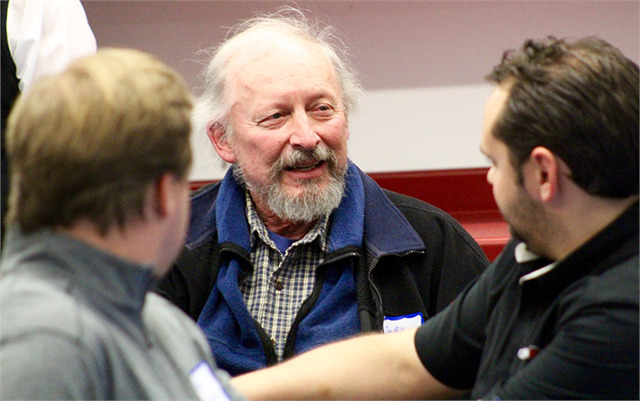 Robert Quené, Interim Executive Director of the Fairlawn Mansion & Museum in Superior, enjoys a laugh during a discussion about favorite museum experiences at the first "Share Your Voice" session in Superior on Oct. 1, 2018. 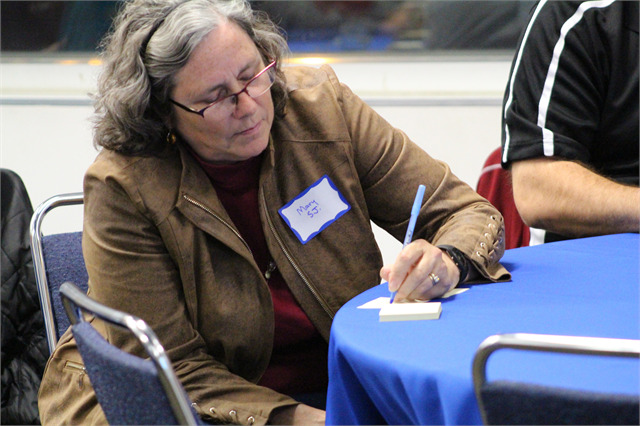 A woman writes down some favorite ideas about the Superior area on a Post-It note during the Society's "Share Your Voice" session on Oct. 1, 2018 in Superior. The Post-It notes were placed on theme boards and used to create a word cloud from the session. 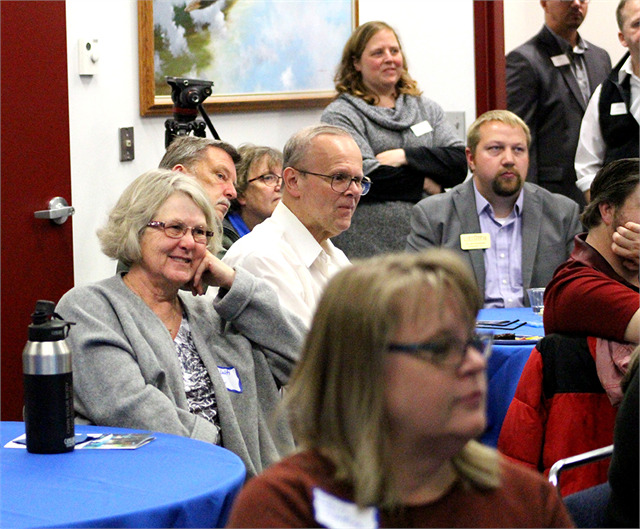 Guests discuss new museum renderings and their favorite museum experiences during the "Share Your Voice" session in Superior. 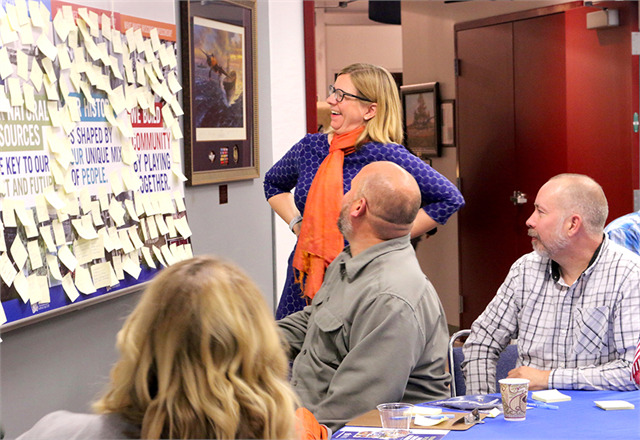 Cybelle Jones of museum exhibit design firm Gallagher & Associates (standing), who led the session, chats with guests about the impressive number of ideas shared on Post-It notes during the "Share Your Voice" session in Superior. A woman writes down favorite and important things about the Superior area to be placed onto "What Makes Wisconsin, Wisconsin?" theme boards along the wall at the "Share Your Voice" event. 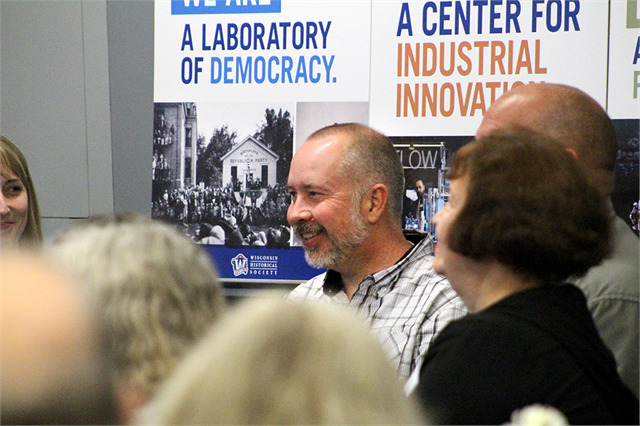 Guests enjoy a laugh during a discussion about favorite museum experiences during the "Share Your Voice" session in Superior. 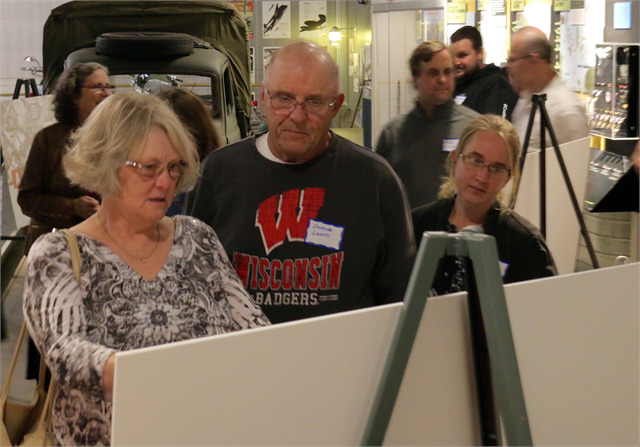 Guests examine new museum exhibit design concept renderings during the "Share Your Voice" session at the Richard I. Bong Veterans Historical Center in Superior. 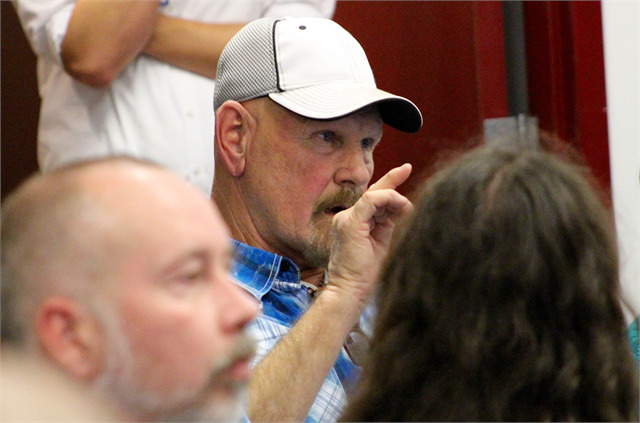 A man listens intently as guests discuss new museum concept exhibit design renderings during the "Share Your Voice" session at the Richard I. Bong Veterans Historical Center in Superior. 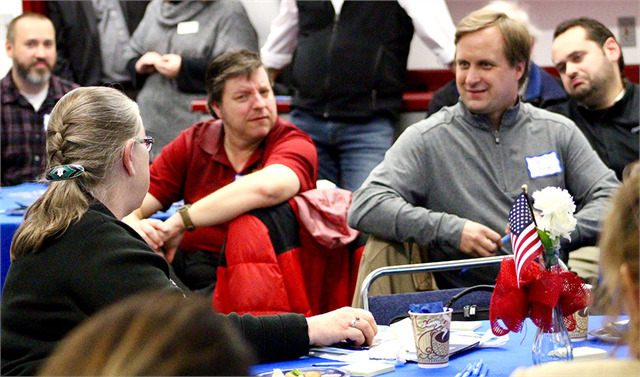 Society Director Christian Øverland welcomes guests to the "Share Your Voice" session in Superior. 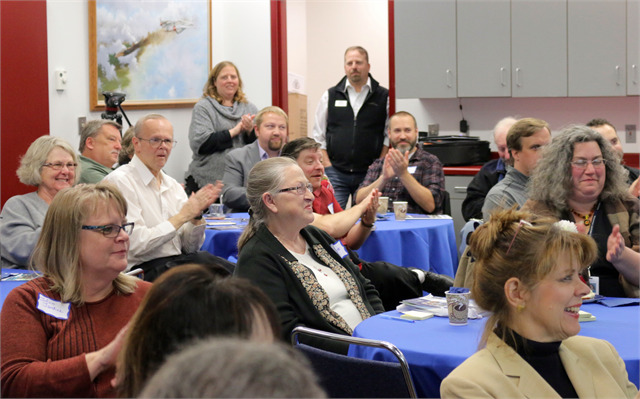 Guests enjoy a laugh during a discussion about favorite museum experiences during the Wisconsin Historical Society's first "Share Your Voice" session Oct. 1, 2018, at the Richard I. Bong Veterans History Center in Superior. 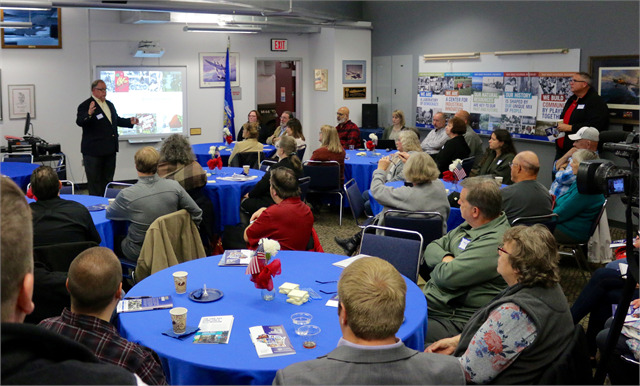 Hayes Scriven, Director of the Richard I. Bong Veterans Historical Center in Superior, welcomes guests and Wisconsin Historical Society staff to the facility at the start of the "Share Your Voice" session on Oct. 1, 2018. 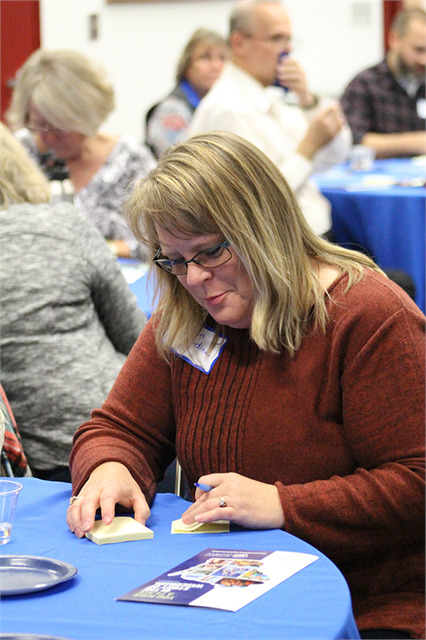 Guests focus as they use Post-It notes to write down favorite and important things about the Superior area during the "Share Your Voice" session on Oct. 1, 2018, in Superior. 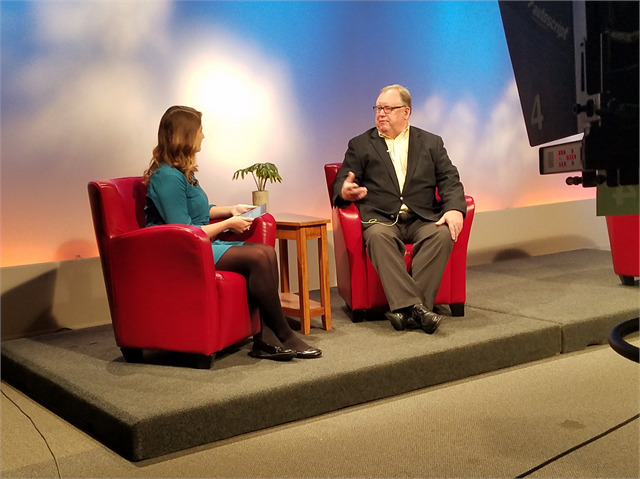 Ken Kurtz of Superior shares his thoughts about important stories about his area to consider telling in a new Wisconsin history museum on Oct. 1, 2018, during the Society's first statewide engagement session in Superior. 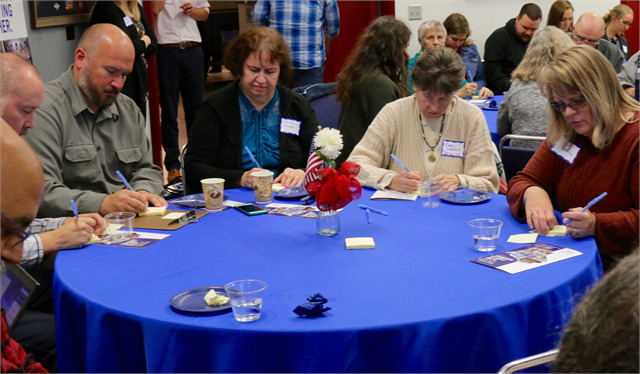 Click here to return to the Share Your Voice page to see more regional dates!